Number 8 is really good at soccer. Really, really good. The parallels for the Portland Timbers between the 2015 MLS Cup winning season and this year's playoff run are fairly dramatic, especially after the Timbers secured their second ever MLS Cup appearance with a gut wrenching 3 to 2 win versus Sporting Kansas City on November 29. Knockout round win? 2015 saw the Double Post win over SKC, 2018 saw the Timbers run FC Dallas out of their own park. Win over Cascadia rival? 2015 had the Timbers beat Vancouver in the conference semifinal with a huge win at B.C. Place in leg 2. 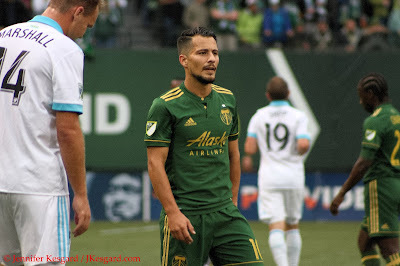 2018 saw the Timbers outlast the Sounders in heart wrenching fashion in extra time and penalties with a huge performance in penalties. Huge leg 2 performance in the conference finals? In 2015, Portland upended a heavily favored FC Dallas side in leg 1 at home, then advanced by drawing FCD at home with a late goal from Lucas Melano giving the Timbers breathing room. 2018 had the Timbers and Sporting play to a scoreless draw in Portland for leg 1, but the Timbers did something that nobody expected in leg 2 - score 3 goals on the road after conceding a goal in the first half to SKC. Without the offside flag being on target, the Timbers could have fallen behind by additional goals as Sporting had a Diego Rubio goal negated for offside in the 49th minute (obvious call on replay) while SKC defender Ike Opara interfered with Timbers keeper Jeff Attinella in the 24th minute off a Daniel Salloi header that hit the net, 4 minutes after Salloi had given SKC the early lead off a pass left by Rubio. The Timbers have been behind the proverbial 8-ball throughout the 2018 postseason; they fell behind versus Seattle at home in leg 1 of the conference semi finals, but Portland was able to secure 2 quick goals to grab the series lead. In the leg 2 match, Seattle leveled the overall score early in the second half until Sebastian Blanco brought the match even. Portland almost won the series in regular time until conceding late, but Dairon Asprilla gave them an advantage with one of the most beautiful headers I've seen ever. Seattle once again drew even, but Portland not only held off conceding more but won the penalty shootout convincingly. In the leg 1 match versus Sporting, Portland had the advantages in offensive statistics and chances, but couldn't put anything past SKC goalkeeper Tim Melia or the stout SKC defense. Portland's defense matched the effort in terms of keeping Sporting in check, so everything fell into the leg 2 match. The Timbers did have one notable advantage - the road goal tiebreaker; anything they scored against Sporting in their home park would force SKC to score one more goal than them in order to advance. The big question in this match would be which team would score first, and if that first goal would change the strategy for either side too dramatically. One year in Portland, all Gio Savarese has done was advance to MLS Cup. 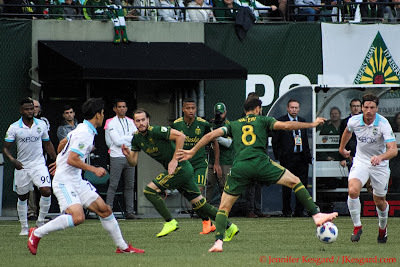 I might have expected some really significant alterations in the Timbers attack and approach if not for one big event in the 40th minute when Andy Polo, back in the starting eleven after missing the first leg due to an ankle injury suffered during international duty, forced Melia to make a quick decision off a turn and shoot play. Blanco dropped in a wonderful pass on the left flank, and Polo outdueled his defender and just missed the goal off the quick shot putting the ball off the side netting. It was a telling moment for the Timbers, because up to that point, they had absorbed all of the pressure and tempo from the SKC offense. The Timbers weren't able to find any possession or threat to counter, despite having one of their strongest available lineups at the start: Jeff Attinella in goal; Jorge Villafana, Liam Ridgewell, Bill Tuiloma and Zarek Valentin on defense; David Guzman and Diego Chara as the defensive midfielders; Polo, Blanco and Diego Valeri as the attacking midfielders; Jeremy Ebobisse as the lone forward. Possessing experience, creativity and pure speed, this was likely the strongest available combination of players, especially considering that Samuel Armenteros continues to battle various ailments that have kept him from the lineup for several weeks now. 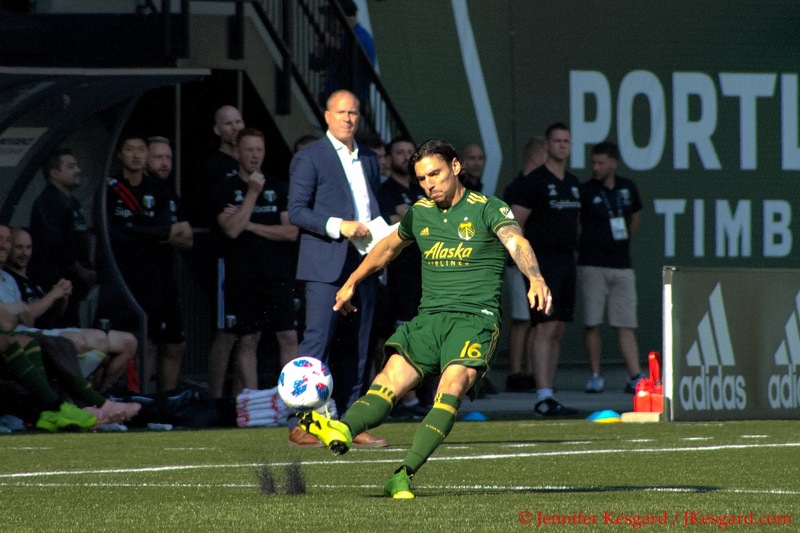 There have been stronger Timbers clubs that might have folded at the prospect of absorbing nearly 40 minutes of pressure, conceding a goal and then having a second waived off due to interference only to have one quality shot that seemed to change the complexion of the match. Portland was having trouble dealing with the creativity and pace of Rubio, who wasn't part of the leg 1 match, and his interplay with Salloi and Johnny Russell was wreaking havoc against the Timbers backline. Attinella was holding up reasonably well under pressure, but the Timbers defense was having trouble adjusting. The lone goal conceded officially was aided by a lackadaisical play from Ridgewell, who had a chance to push a loose ball out of danger along the touchline or back to Attinella, but Rubio beat him to the ball and put a cross past Attinella in a place where Salloi could tap it in. Ridgewell has shown bouts of being slow to react on plays at times, and the offense was having trouble possessing or doing much of anything until Polo's shot. Whatever had happened before wasn't important as the team appeared to find composure or energy to finish out the half, while Savarese was quick to point out that his team needed to find their pace in order to get back into the match. Blanco's second half goal is the best goal I've seen for the MLS Timbers. Rubio's waived off goal to start the second half was fairly obvious, as he was steps behind the Timbers defense as Tuiloma played exceptional positioning to mark him yet be in good positioning to show offside once the pass was released. It was three minutes later when the match complexion was dramatically changed courtesy of Blanco, who was making a run on the left off a turnover as SKC had pushed players forward. Blanco moved quickly and decisively, and launched one of the most epic distance shots I've seen from the left flank about 25 yards from goal, and the shot uncorked and flew past Melia into the upper right corner of goal to level the score. It was crazy, dramatic, awesome, and it put Portland back in control in the aggregate score series; while the score was drawn at 1, Portland had the road goal that was enough to give them the advantage. The situation changed even further when Villafana found Blanco on the same left side in the 61st minute, and Seba put a pass into the box for Ebobisse, who had a sliver of space to work. Jeremy took the quick shot but it was deflected up with Melia and Opara charging against Ebobisse, while Valeri had staked out space just behind the play. The ball found Diego first, and he was able to put a header over the defense and into the net to give the Timbers a 2 to 1 lead. The second road goal now meant that Sporting would need to get 2 goals in just 29 minutes to have any hope of advancing. The Sporting crowd was very upset at the play, and beer bottles and cans soon found their way onto the pitch, necessitating Center Official Mark Geiger to pull both teams off the pitch and SKC Coach Peter Vermes to plead with the fans to stop throwing things. Order was restored moments later, but Vermes pulled Salloi for Gerso Fernandes to see if he could jump start the offense. Gerso challenged Attinella in the 67th minute with a close range shot on the left post, but Jeff was up to the task to make the save. Minutes later, Felipe Gutierrez challenged Jeff with a low range shot that he knocked away, but Fernandes was able to give his team hope in the 81st minute off a Graham Zusi cross from six yards out. Fernandes was able to break down the defense with a well placed shot, but the Timbers' defense was already starting to struggle. Valentin, carded in the first half for a professional foul, executed a late slide tackle on Fernandes minutes earlier to give SKC a free kick just outside the box, but since it was from behind and late, it could have been (and maybe should have been) his second caution. Savarese brought on Alvas Powell and Lawrence Olum to give more bodies to the backline for the late run, but with Fernandes' late goal, the home side finally had some hope that maybe they could steal this match late. Once Geiger's crew had signaled 9 minutes of stoppage for the second half, mostly due to the match delay and a couple of injuries, Portland knew this was going to be a wild ride to the finish. Valentin was very fortunate to avoid getting a second caution in this match. But this group didn't fold under the pressure and kept organized. Late in stoppage, Blanco was able to push a clearance out of the box to relieve pressure, and Diego Chara ran the ball down on the left flank in space. After settling it briefly, he put a deft pass to an open Valeri with just Melia left to beat in space, and Valeri was able to secure the match very late by tallying his second goal of the night. The match was now officially 3 to 2 Timbers, and with just seconds on the clock before the final, the Timbers could start to breathe slightly easier. You could see the sense of relief as the final whistle blew, and Portland could celebrate the result as the 2018 MLS Western Conference Champions. The Timbers would advance to play in the 2018 MLS Cup, and the venue was determined earlier in the day when Atlanta United eliminated the New York Red Bulls by a 3 to 1 aggregate series score. Atlanta and New York were higher in the regular season table, so the Eastern Conference team that won their final would end up hosting the championship. For Portland, it was their third qualified final appearance in their overall history (1975 Soccer Bowl, 2015 MLS Cup) and gives the Timbers a chance to earn their second ever championship cup. A team that had fought against odd circumstances, a very slow start to the year, player adjustments, injuries, inconsistent play, struggles on the road, and facing huge road obstacles during the postseason had overcome it all to secure the berth. Ironically, Atlanta United is the MLS team that most experts felt would be in this situation. Their offense, with Josef Martinez, Miguel Almiron and Hector Villalba, has been scoring goals in bunches all year, and their defense has done enough against their opponents to vault them to 21 wins in 2018. The key addition to their team for 2018 is a familiar name to Timbers fans in Darlington Nagbe, who was Portland's first ever MLS Super Draft pick back in 2011 during the franchise's very first days. Over 7 seasons in Portland, Nagbe tallied 28 goals in 226 appearances, putting him near the top in Timbers history for games played, but over his time here, his role was never clearly defined. Showing great talent and having a knack for the dramatic goals, Nagbe was never the scorer that many thought he should be during his tenure, and his creativity with the ball faltered at times. However, as a ball possessing midfielder that could run from box to box and make dramatic runs holding the ball in traffic, there isn't anyone better in MLS than Nagbe. And it's this possession skill that has added a new dimension to the track meet offense that Atlanta has run in previous seasons under Coach Tata Martino. Martino is slated to leave United at the end of this season, and they would love nothing more than to send him off a winner in front of their home crowd. 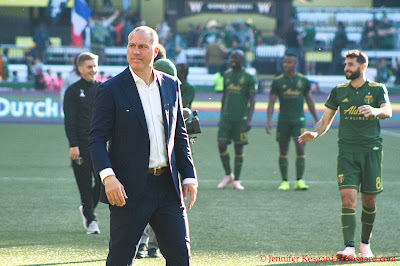 However, few clubs in the playoffs could match Portland's resourcefulness during their season, which has been a pillar of Gio Savarese's attack all year.